Syrian President Bashar al-Assad says he has given new evidence to Russia on the rebels' use of chemical weapons. In an interview with China's state-owned CCTV channel, Assad said the rebels were working under foreign directives. The Syrian president said they could try and prevent inspectors from reaching chemical weapons sites. He also said that Syria stopped producing chemical weapons in the 1990s. Syrian Deputy Prime Minister Qadri Jamil was quoted Thursday suggesting that neither side in the country's civil war is capable of military victory and that the government of Bashar al-Assad may seek a cease-fire. "Neither the armed opposition nor the regime is capable of defeating the other side," Jamil told the Guardian newspaper in an interview published Thursday. "This zero balance of forces will not change for a while," he added. 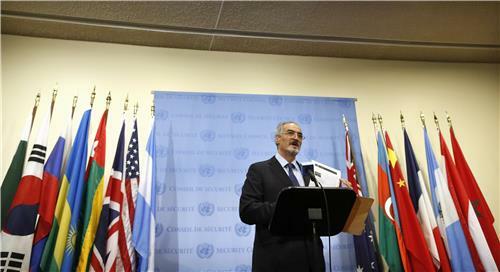 He also indicated that the regime may call for a cease-fire if proposed peace talks, known as Geneva 2, come to fruition. While both the U.S. and Russia have agreed to the talks in principle, it is uncertain which of the groups currently fighting in Syria would attend and under what terms. Jamil indicated that the government of Assad could accept a cease-fire "under international observation" if it were agreed to by armed opposition forces. For Russian President Vladimir Putin, success in Syria involves multiple components. He wants Russia to re-emerge as a player of importance in the Middle East, a goal he already seems to have attained. He wants to keep Syrian President Bashar al-Assad in power and see Islamist rebels defeated. He wants to see Syria's chemical weapons accounted for and destroyed. He wants tensions to remain high in the region, which keeps the price of oil up. And he wants to humiliate, or at least humble, President Barack Obama. Putin is old-fashioned enough for Russia's greatness to matter to him. He does not want to be the captain of a team that finishes low in the division. The shirtless photo ops are just the outward sign of a type of Slavic machismo that prides itself on being able to endure anything and ultimately emerge victorious. Unfortunately for Russia, there are few places today where the Kremlin matters. Eastern Europe is safely under NATO's shield. Ukraine is ornery and independent and, unlike Georgia, too big to engage militarily. The former Soviet republics in Central Asia have become adroit at playing Russia against China. Syria has thus presented a unique opportunity to make a difference. After two decades of, as Moscow sees it, condescension and contempt from the United States, Russia's counsel must now be sought and its influence solicited. Of course, the one place where Russia has always maintained real power, the U.N. Security Council, will play a significant role in shaping the situation in Syria. Russian President Vladimir Putin said on Thursday he could not be 100 percent certain that a plan for the destruction of Syrian chemical weapons would be carried out successfully but he saw positive signs for hope. "Will we be able to accomplish it all? I cannot be 100 percent sure about it," Putin told a gathering of journalists and Russia experts. "But everything we have seen so far in recent days gives us confidence that this will happen." Putin has urged the international community not to put the burden of dealing with Syria's chemical weapons arsenal solely on Russia. "This is not the first time I hear that special responsibility rests with me," said Putin. "Special responsibility rests with all of us, and it is equally shared. If the attempts to resolve the problem peacefully fail, it will be very bad." Russia on Wednesday accused UN inspectors studying last month's chemical attack in Syria of ignoring "very factual" evidence provided by the Damascus regime, as Moscow and Washington continued to trade accusations over who was to blame for the attack. Evidence related to the deadly August 21 incident "was given to Mr [Ake] Sellstrom who headed the group of UN inspectors," Russia's deputy foreign minister Sergei Ryabkov said after talks with Syria's leadership in Damascus. "We are upset that it did not receive adequate attention in the report," he said in remarks aired on Russian television. I am pleased to join you for my traditional press conference as we kick-off the 68th session of the General Assembly. This is a crucial period for global cooperation. Syria is the biggest peace, security and humanitarian challenge we face. Let us be clear: the use of chemical weapons in Syria is only the tip of the iceberg. The suffering in Syria must end. Next week, as world leaders gather here, I will make a strong appeal to Member States for action now. Many other issues on our agenda also merit urgent attention – not only other conflicts but also important questions of sustainable development, health, hunger and climate change. I understand that you had a good press conference with the President of the General Assembly. Over the coming days, we will put a spotlight on these, as well. At least 131 Heads of State or Government will be here next week -- one of the highest turnouts in United Nations history. At least 60 Foreign Ministers will join them. I will meet with as many world leaders as I can. I am determined to pack a lot into these encounters. We have much to discuss. In my speech to the General Assembly, I will call on world leaders to uphold their political and moral responsibilities to serve, to listen, to invest, to respond to the rising and justifiable demands of people across the world for lives of freedom and prosperity. We are moving ahead at full steam towards the crucial year of 2015, the deadline for achieving the Millennium Development Goals. We will showcase MDG successes throughout the week and at a special partnership event on Monday. The global discussion on the post-2015 development agenda is also well under way. I will use next Wednesday’s special event to officially launch my report, “A Life of Dignity for All”, which contains my vision of the transformations we need. This month will also see the release of another critical report: the latest assessment of the Intergovernmental Panel on Climate Change. Its message will surprise no one: the heat is on all of us. I also want to stress the importance of the very first event of the week: the Assembly’s high-level session on disabilities and development. Fifteen per cent of the world’s people – a huge portion of humankind – live with some form of disability. The post-2015 agenda must take their needs and aspirations into account. A world that recognizes their rights is a world that will benefit all of us. The situations in Afghanistan, Egypt, Mali and the Central African Republic will also be high on the agenda, as we assess new approaches we are taking in peacekeeping, diplomacy and support for countries in transition. We will hold a meeting of the oversight mechanism for the peace agreement that the United Nations brokered earlier this year for the Democratic Republic of the Congo and the Great Lakes Region. And the Middle East Quartet will meet for the first time in more than a year to support the resumed Israeli-Palestinian negotiations. The next week or two will bring many opportunities for common progress. But success will depend on ever deeper levels of cooperation – and contributions from our partners. In that spirit, I look forward to joining Stevie Wonder and thousands of other good friends of the United Nations at the Global Citizen Festival in Central Park. I hope you will all join that event. We will raise our voices for action against poverty – the number one struggle of our time. We have a full agenda. But the events of the past days have shown once again the power of the United Nations to uncover the facts – to resolve differences – to help avoid bloodshed and forge consensus for peace and progress. We must harness that spirit for action to address our immediate crises and achieve our longer-term goals. The Council heard this morning from the Secretary General on the findings of Dr. Sellstrom and his team of chemical weapons experts. Before I say anything else, let me do as I assume my colleagues has done which is to express the great admiration that the United States has and President Obama has personally for the inspectors who put their lives on the line to try to bring back this evidence so the world would know what happened on August 21st. It is no secret that they ran into significant security problems on the ground, but that did not stop them from moving forward. And again, seeking and in the end succeeding in bringing this important information back. So we have great admiration for them. As you have already heard from the Secretary General and from my colleague Ambassador Lyall Grant, the UN report confirms unmistakably that chemical weapons were used in Syria on August 21st. Now, the mandate of the chemical weapons team, was as you well know, not to investigate culpability, but the technical details of the UN report make clear that only the regime could have carried out this large-scale chemical weapons attack. We will analyze the UN’s findings in greater detail, very carefully. But based on our preliminary review, I will note one particular observation. We have associated one type of munition cited in the UN report – 122mm rockets – with previous regime attacks. We have reviewed thousands of open source videos related to the current conflict in Syria and have not observed the opposition manufacturing or using this style of rocket. In addition, and I just want to underscore something that Ambassador Lyall Grant shared, Mr. Sellstrom noted in response to a question from Russia that the quality of the sarin was higher than that of the sarin used in Saddam Hussein’s program. Again, higher than the quality of that used in Saddam Hussein’s program. Mr. Sellstrom also stated that the weapons obtained on the site, on the scene of this monstrous crime, were professionally made. He said that they bore none of the characteristics of improvised weapons. We understand some countries did not accept on faith that the samples of blood and hair that the United States received from people affected by the August 21 attack contained sarin. But now Dr. Sellstrom’s samples show the same thing. And it’s very important to note that the regime possesses sarin, and we have no evidence that the opposition possesses sarin. Let me also remind you of what we know coming into today's briefing. In the days before the attack, Assad’s chemical weapons experts prepared for an attack. They distributed gas masks to regime troops. They fired rockets from a regime-controlled area into 12 neighborhoods that the regime had been trying to clear of opposition forces. And here again I want to underscore, it defies logic to think that the opposition would have infiltrated the regime-controlled area to fire on opposition-controlled areas. And again, it also is worth underscoring that this is the largest chemical weapons attack in 25 years. And that is something that the Secretary General stressed. The largest attack since Halabja. As I have found over the last weeks, the more countries around the world are confronted with the hard facts of what occurred on August 21, the more they recognize that the steep price of impunity for Assad could extend well beyond Syria. That is why President Obama sought to mobilize the international community to act to deter and degrade Assad’s ability to use or proliferate these weapons. In one week, the United States has made great progress in our effort to bring these weapons under international control. This substantial progress could not have been achieved without the threat of force and President Obama’s decision to explore this diplomatic path. The framework reached between the United States and Russia provides a path for the elimination of Syrian chemical weapons in a transparent, expeditious, and verifiable manner, which could end the threat that these weapons pose not only to the Syrian people, but to the region and the world. Let me say a word, building on Ambassador Lyall Grant’s comments, about next steps. Action moves now to the Organization for the Prohibition of Chemical Weapons in The Hague and here to New York. The United States and Russia are presenting a draft decision to the OPCW, which calls for special measures for stringent verification and an accelerated timeline for destruction. Meanwhile, the US and Russia have agreed to support a Security Council resolution to reinforce the anticipated decision of the OPCW Executive Council, provide for verification and effective implementation, and request the Secretary General recommend to the Security Council the appropriate UN role in eliminating Syria’s CW program. We also agreed, as you know, that in the event of Syria’s non-compliance, unauthorized transfer or CW use by anyone, that we will impose measures under Chapter VII. Let me be clear. The US position has been consistent throughout this process and will remain so going forward. We have insisted on a plan for the removal and destruction of chemical weapons that is timely, transparent, credible and verifiable. The obligations on the Syrian government must be clearly established. And this effort must be enforceable. We believe the US-Russia framework, if fully implemented, can achieve this. We also think it can lay the foundation for a political solution to the underlying conflict and keep the political process moving forward toward Geneva II. The question before the Security Council today is whether we will shoulder the responsibility of agreeing to take the kind of credible, binding action demanded by this horrible event. And that is the decision we must make. Speaking before a meeting held by the Chicago Council on Global Affairs this morning, Senator Lindsey Graham (R-SC) called it "absurd" that we would allow the Russians to be in charge of the containment of Syria's chemical weapons when they doubt the source of the attack. The United States, Britain and France renewed a push Monday for a U.N. resolution aimed at "enforcing" a pledge by Syria to destroy or hand over its chemical weapons arsenal. During talks in Paris on Monday, leaders from the U.S. and France insisted that a military response to the Aug. 21 chemical gas attack that killed hundreds remains on the table, and the countries are pressing for a U.N. resolution reflecting that. "Each of us here today are here to emphasize the same thing -- that what we achieved in this agreement has to be translated into a U.N. resolution. It has to be strong, it has to forceful it has to be real, it has to be transparent, it has to be timely -- all of those things are critical -- and it has to be enforced," said U.S. Secretary of State John Kerry. "If the (President Bashar al-) Assad regime believes that this is not enforceable and we are not serious, they will play games." The U.S. and Russia have brokered an agreement between Syria and the international community that would avert the immediate threat of a military attack from the U.S. government. The agreement calls for an inventory of Syria's chemical weapons program within one week, with all components of the program out of the country or destroyed by mid-2014. U.N. chemical weapons inspectors turned over a highly anticipated report on last month's alleged gas attack in Syria to Secretary-General Ban Ki-moon on Monday. The attack, in which the U.S. says more than 1,400 people died, nearly escalated into a U.S.-led punitive military strike against the government of Syrian President Bashar al-Assad -- with some countries urging for the report to be completed before taking action. The report's release comes two days after Russia and the United States agreed on a framework for the removal of Syria's chemical weapons -- averting military action if Assad turns over his chemical weapons to the international community for destruction. Ban will brief a closed session of the U.N. Security Council on Monday morning and the General Assembly later in the day on the report's findings. He is scheduled to hold a press conference at 12:50 p.m.
Ban said Friday that he believed there would be "an overwhelming report" that chemical weapons were used in the attack. The inspection team, led by Swedish chemical weapons expert Ake Sellstrom, was mandated to report on whether chemical weapons were used in the Aug. 21 attack and, if so, which chemical agents were used -- not who was responsible. President Barack Obama suggested Sunday that "remarkable" progress on Syria’s chemical weapons was the direct result of U.S. pressure, as a minister in Damascus thanked "Russian friends" and Moscow’s diplomacy for the breakthrough. In an interview with ABC’s This Week, Obama defended his handling of the crisis, insisting that U.S. policy had been consistent throughout. "As a consequence of the pressure that we’ve applied over the last couple of weeks, we have Syria for the first time acknowledging that it has chemical weapons, agreeing to join the convention that prohibits the use of chemical weapons. And the Russians, their primary sponsors, saying that they will push Syria to get all of their chemical weapons out of the county," Obama said. But his comments came as the first response from Damascus put Russian diplomacy at the heart of the agreement. Speaking to Russian state news agency Ria Novosti, Syria’s minister for national reconciliation Ali Haider, claimed the U.S.-Russian agreement as a "victory for Syria won thanks to our Russian friends." He added that "Russian diplomacy and the Russian leadership" had prevented a war against Syria. The opposition Syrian National Coalition elected a moderate Islamist as provisional prime minister Saturday, in a move it hopes will boost the opposition's credibility amid an international dialogue that aims to settle two-and-a-half year conflict. The coalition hopes the election of Ahmed Tumeh, 48, will garner respect for the opposition after Russia and the United States agreed earlier Saturday on a framework for removing Syrian President Bashar al-Assad's chemical weapons arsenal. It is hoped that the negotiations on chemical weapons could lead to a wider political solution to a conflict that has killed over 100,000 people. A further six million and counting have been displaced or exiled. Tumeh is entrusted with the difficult task of restoring order to areas no longer controlled by Assad, coalition members told Reuters. Tumeh, a former political prisoner from the eastern province of Deir al-Zor, got 75 votes out of 97 cast in a coalition ballot in Istanbul, the sources said. France, Saudi Arabia, the United Arab Emirates and Jordan have agreed to strengthen the Syrian opposition in its battle against Assad's regime, the French presidency said. After a meeting in Paris, French President Francois Hollande and foreign ministers from the three countries "agreed on the need to strengthen international support for the democratic opposition to allow it to face attacks by the regime," the Elysee said in a statement. FOREIGN MINISTER LAVROV: (Via interpreter) (In progress) – delegations that accompany us. Of course, we would like you to have unbiased ideas about what we are going to do. But I think that you understand well before we start to tell you what we are going to do, we should get down to a very serious work, the work which is dedicated to a principled agreement to solve once and for – till the end the Syrian problem and the adhesion of Syria to the convention, to the Chemical Weapons Convention, to the Organization for the Prohibition of Chemical Weapons. These documents are officially tabled by Damascus to the corresponding agencies, and we will have to have a look at the corresponding documents with the participation of experts that have all the qualifications and professionalism how to work further, not to postpone this process, in strict compliance with the rules that are established by the Organization for the Prohibition of Chemical Weapons. We proceed from the fact that the solution on this problem will make unnecessary any strike on the Syrian Arab Republic, and I am convinced that our American colleagues, as President Obama stated, are firmly convinced that we should follow the peaceful way of resolution of the conflict in Syria. And I should say that we spoke with John by phone several times when we prepared for this meeting. We think that the development of the events gives us an additional opportunity for Geneva 2 in order to move this today’s situation from the stage of military confrontation and to prevent any terroristic threats which is expanding in Syria and in the region, and to convene the conference during which the Syrian parties, in accordance with the Geneva communiques, should agree on the creation of the transition body that will have all the executive functions. And this is our common objectives, and I hope that our today’s and tomorrow work and all other efforts that we are going to continue will help us to move on and to achieve this objective. 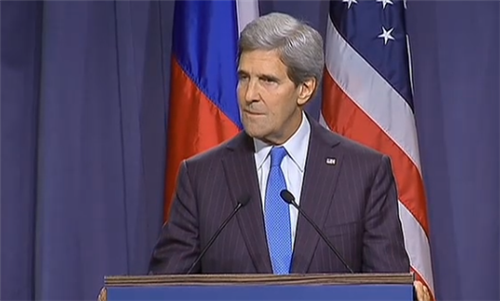 SECRETARY KERRY: Well, thank you very much, Foreign Minister Lavrov. My privilege to be here with our delegation, and I want to thank you and your delegation on behalf of all the people who hope that diplomacy can avoid military action, and we thank you for coming quickly to Geneva in order to have this important conversation that we will engage in. Over one year ago, President Obama and President Putin directed high-level experts in our governments, both of our governments, to work together to prepare contingencies involving Syria’s chemical weapons. Foreign Minister Lavrov and I have been in regular contact about this issue since my visit to Moscow earlier this year. And as Foreign Minister Lavrov said to me in a phone conversation after St. Petersburg and the meetings there, President Putin and President Obama thought it would be worthwhile for us to work together to determine if there is life in this concept. This challenge obviously took on grave urgency on August 21st when the Syrian regime used chemical weapons in a massive and indiscriminate way against its own citizens. President Obama and dozens of our partners believe that that action is unacceptable, and we have in no uncertain terms made it clear that we cannot allow that to happen again. In light of what has happened, the world wonders and watches closely whether or not the Assad regime will live up to its public commitments that it has made to give up their chemical weapons and whether two of the world’s most powerful nations can together take a critical step forward in order to hold the regime to its stated promises. I have seen reports that the Syrian regime has suggested that as part of the standard process they ought to have 30 days to submit data on their technical – on their chemical weapons stockpile. We believe there is nothing standard about this process at this moment because of the way the regime has behaved, because the – not only the existence of these weapons, but they have been used. And the words of the Syrian regime, in our judgment, are simply not enough, which is why we’ve come here in order to work with the Russians and work with Sergey Lavrov and his delegation here in order to make certain that this can, in fact, be achieved. The United States and Russia have had and continue to have our share of disagreements about the situation in Syria, including a difference as to the judgment we just offered with respect to who may have done that. But what’s important as we come here is that there’s much that we agree on. We agree that on August 21st Syrian men, women, and children died grotesque deaths due to chemical weapons. We agree that no one anywhere at any time should employ chemical weapons. And we agree that our joining together with the international community to eliminate stockpiles of these weapons in Syria would be an historic moment for the multilateral nonproliferation efforts. We agree on those things. We agree that it would help to save lives if we could accomplish this, that it would reduce the threat to the region, that it would uphold the norm that was established here in Geneva almost a century ago, and it would achieve the best of our – all of our aspirations for curbing weapons of mass destruction. Foreign Minister Lavrov and I have come to Geneva today to begin to test these propositions, not just on behalf of each of our countries but on behalf of everybody who is interested in a peaceful resolution. So I welcome the distinguished Russian delegation and I am proud that at President Obama’s direction we have a delegation here which I lead of some of our nation’s foremost chemical weapons experts; people who’ve dedicated their lives every day to countering the proliferation of these weapons and to bringing about their eventual elimination from this Earth. The Russian delegation has put some ideas forward, and we’re grateful for that. We respect it. And we have prepared our own principles that any plan to accomplish this needs to encompass. Expectations are high. They are high for the United States, perhaps even more so for Russia to deliver on the promise of this moment. This is not a game, and I said that to my friend Sergey when we talked about it initially. It has to be real. It has to be comprehensive. It has to be verifiable. It has to be credible. It has to be timely and implemented in a timely fashion. And finally, there ought to be consequences if it doesn’t take place. Diplomacy is and always has been President Obama’s and this Administration’s first resort, and achieving a peaceful resolution is clearly preferable to military action. President Obama has said that again and again. Now, it’s too early to tell whether or not these efforts will succeed, but the technical challenges of trying to do this in the context of a civil war are obviously immense. But despite how difficult this is, with the collaboration of our experts and only with the compliance from the Assad regime, we do believe there is a way to get this done. We have come here to define a potential path forward that we can share with our international partners, and together we will test the Assad regime’s commitment to follow through on its promises. We are serious – Mr. Foreign Minister, we are serious, as you are – about engaging in substantive, meaningful negotiations even as our military maintains its current posture to keep up the pressure on the Assad regime. Only the credible threat of force and the intervention of President Putin and Russia based on that has brought the Assad regime to acknowledge for the first time that it even has chemical weapons and an arsenal, and it is now prepared to relinquish it. President Obama has made clear that should diplomacy fail, force might be necessary to deter and degrade Assad’s capacity to deliver these weapons. It won’t get rid of them, but it could change his willingness to use them. The best thing to do, we agree, is remove them altogether. Our challenge here in Geneva is to test the viability of placing Assad’s chemical weapons under international control, removing them from Syria, and destroying them forever. But the United States has also made clear that the deaths of more than 100,000 Syrians and the displacement of millions either internally or as refugees remains a stain on the world’s conscience. We all need to keep that in mind and deal with it. And that is why Foreign Minister Lavrov and I continue to work with Joint Special Envoy Brahimi and ourselves under the auspices of the Geneva communique. The Foreign Secretary just mentioned this and his hopes. We share those hopes that could foster a political solution to a civil war that undermines the stability of the region, threatens our own national security interests, and compels us to act. That is our hope and that is what we fervently hope can come out of this meeting and these negotiations. FOREIGN MINISTER LAVROV: With your permission, just two words. (Via interpreter) I’m not prepared with the (inaudible) political statement to (inaudible) the Syrian problem, because our approaches are clear and they are stated in the statements of the President of the Russian Federation Vladimir Putin and in his article in The New York Times. And I’m convinced that all of you read this article and I decided not to lay out here our diplomatic position. The diplomacy likes silence. And we’re intent to find compromises, and I am sure that John, in his presentation of the American position, also showed that they would like to find mutual consensus and be – if we follow this way, I hope that we will achieve all the successes. SECRETARY KERRY: I lost the last part of the – can you give me the last part of the translation, please? Hello? SECRETARY KERRY: You want me to take your word for it? (Laughter.) It’s a little early for that. FOREIGN MINISTER LAVROV: Okay. Thank you. Syria's UN envoy says "legally speaking" Syria is now a full member of the global anti-chemical weapons treaty, Reuters reports. Bashar Jafari told reporters in New York after submitting relevant documents to the United Nations that Syria has "legally" become a part of the Chemical Weapons Convention . Upon having received the documents earlier, the UN had said "the document from the government of Syria is being translated, [and it] is to be an accession document concerning the Chemical Weapons Convention." Secretary of State John Kerry rejected Syrian President Bashar Assad's suggestion that he begin submitting information on Syria's chemical weapons arsenal one month after signing an international chemical weapons ban. 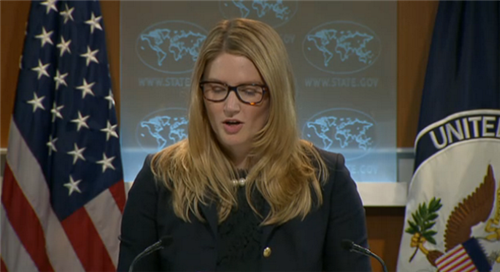 Awkward - Kerry jokes "you want me to take your word" to Lavrov after lost translation - that is a good sign no? 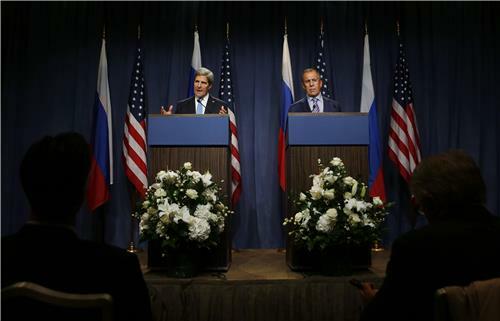 Lavrov made short statement, said he won't lay out diplomacy at press conference. Referenced Putin's op-ed in The New York Times.